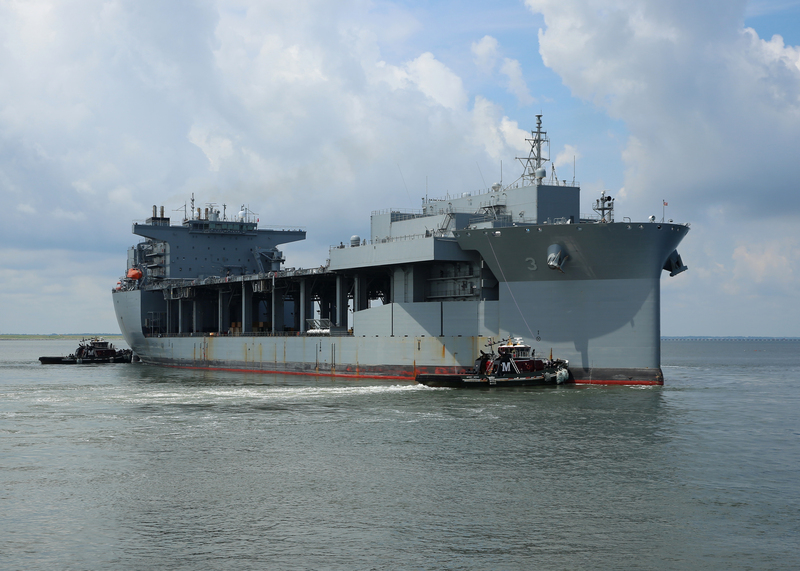 The Military Sealift Command expeditionary mobile base USNS Lewis B. Puller (T-ESB 3) departs Naval Station Norfolk to begin its first operational deployment on July 10, 2017. Puller is deploying to the U.S. 5th Fleet area of operations in support of U.S. Navy and allied military efforts in the region. US Navy photo. The Navy will re-designate its first Expeditionary Landing Base ship a warship this week, converting the Military Sealift Command ship USNS Lewis B. Puller (T-ESB-3) into USS Lewis B. Puller (ESB-3) so it can better meet operational needs abroad, USNI News has learned. Chesty Puller has already departed Naval Station Norfolk for its maiden deployment and will have a commissioning ceremony in U.S. 5th Fleet tomorrow to formally bring the ship into the Navy’s warship fleet. “Converting ESB-3 to a commissioned warship (USS) will allow U.S. Central Command and 5th Fleet the flexibility needed to meet challenges in the region,” Navy spokesman Lt. Seth Clarke told USNI News. Additionally, the Navy is studying making the ship a part of the Forward Deployed Naval Forces in Bahrain. “ESB-3 is scheduled to return to the United States at least every five years for maintenance availability. 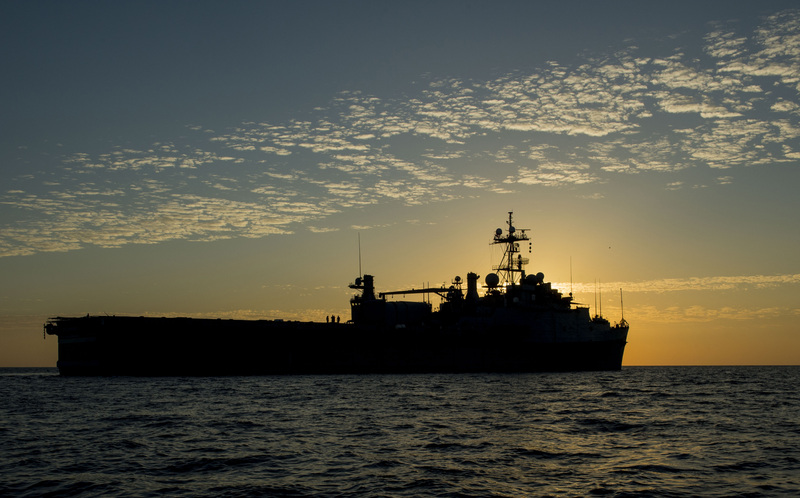 The Navy is currently conducting a cost-benefit analysis for making ESB-3 a forward-deployed naval force [ship], which would allow depot-level maintenance beyond voyage repairs to be conducted overseas,” Clarke added. 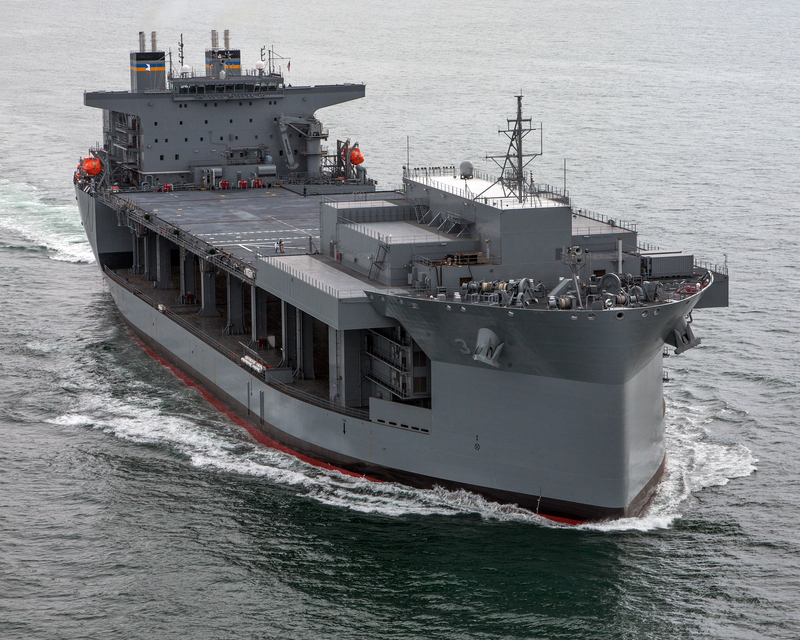 Puller will join the Afloat Forward Staging Base USS Ponce (AFSB(I)-15) in 5th Fleet. The two will operate together for now, Clarke said, with Ponce eventually leaving theater for a 2018 planned decommissioning in Norfolk. Puller was designed and built to be the permanent replacement for the temporary Ponce – which was converted from an amphibious transport dock (LPD) to an AFSB in 2012 to meet an urgent need in the Middle East. 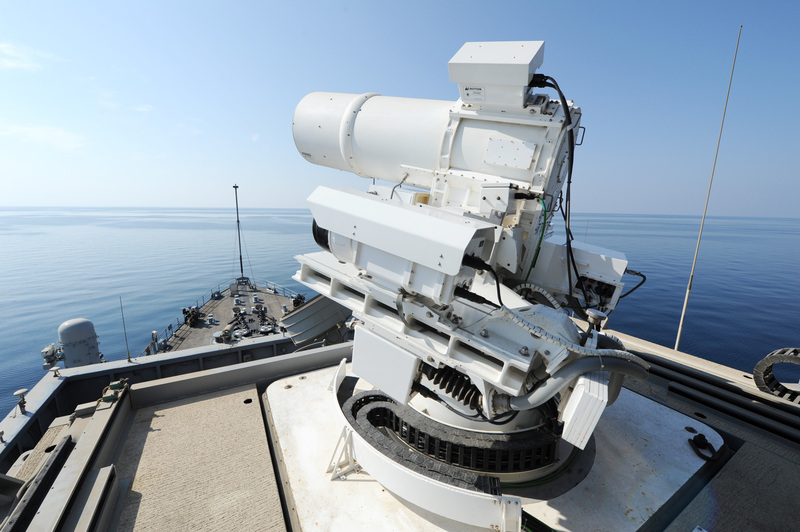 In addition to supporting mine countermeasures helicopters and special operators in the Middle East, Ponce has gained attention for hosting the Laser Weapon System (LaWS). Though Puller will ultimately replace Ponce as the staging base in theater, the LaWS will not be moved to the new ship. The Afloat Forward Staging Base (Interim) USS Ponce (ASB(I) 15) conducts an operational demonstration of the Office of Naval Research (ONR)-sponsored Laser Weapon System (LaWS) while deployed to the Arabian Gulf on November 17, 2014. US Navy photo. “While LaWS on Ponce provided the Navy some initial learning in an operational environment, including how to maintain such a system in the stressing maritime environment, there are no plans to incorporate LaWS on Lewis B. Puller at this time. The Navy will continue to explore options for incorporating directed energy (DE) weapons aboard Navy assets. DE has the potential to offer game-changing capabilities for our sailors and Marines, which include: rapid engagement, low cost per engagement, deep magazines, and the ability to tailor effects to specific targets and missions,” Clarke said. Puller will retain the hybrid crew it was built to host, and that Ponce used. The ship has a large flight deck in the center of the ship that separates uniformed and civilian mariner berthing spaces. Clarke said the conversion to a USS warship requires the addition of an O-6 commanding officer billet, which will be added through a redistribution of existing billets. The ship already had a stateroom for a commanding officer and therefore needs no physical modifications as a result of the new designation. The crew for USS Lewis B. Puller will now include five naval officers, 96 enlisted sailors to operate the flight deck and support operational detachments, and 44 civilian mariners from MSC to operate and maintain the flight deck and engineering spaces. Clarke noted this hybrid crew concept is also used on submarine tenders USS Frank Cable (AS-40) and USS Emory S. Land (AS-39) and command ship USS Mount Whitney (LLC-20), along with Ponce. The change to a USS warship creates no additional work for the engineers supporting the ship at Naval Sea Systems Command or the requirements officers at the Pentagon, he said, and creates to changes in training or equipping the ship for operations. Additionally, Puller’s new designation does not necessarily mean follow-on ESBs would be designated a USS warship either. Clarke said that “the Navy will assess each ship on an individual basis, weighing combatant commander mission requirements and the projected area of operation for each ship.” And the Expeditionary Transport Docks (ESDs), from which the ESB design was derived, are not set for USS designation either. “The intent is not to set a precedent for other classes of ships, but to maximize the capabilities that ESB has, and provide combatant commanders with assets that enable them to meet all operational requirements,” Clarke told USNI News.